eCommerce has always been a complex experience. SSL, merchant accounts, API integration, shopping carts, and the hurdles of shipping and handling were enough for developers to charge absurd amounts of money. And most of the time, that investment would leave you with a store that still needed an interface that was easy to navigate and SEO-friendly. That, however, is starting to change. Companies like Volusion and Shopify (affiliate links) have completely disrupted an industry in which the barrier of entry began at $3500. Now, you can get your store started for as little as $29/month. Turning a profit, however, is a much more exciting challenge, as it should be. A lower barrier of entry means more competition, which means only truly unique stores will thrive. That’s when a successful search engine marketing (SEM) team comes into place. If the money you saved on a custom ecommerce webdesign can be applied to SEM, it will spare you of some frustrating experiences as your store grows. Luckily, this post will offer 4 simple steps to improve your ecommerce SEO. One of the most daunting tasks of setting your store is uploading your products. It’s not that bad if you have 10 products, but it can be a monumental effort if you have 150, 500, or 1000. Each product is a page by itself, and needs descriptive, original content, as well unique Title and Description tags, along with proper internal and external linking and social sharing buttons. For every product page, you’re basically optimizing a little website. 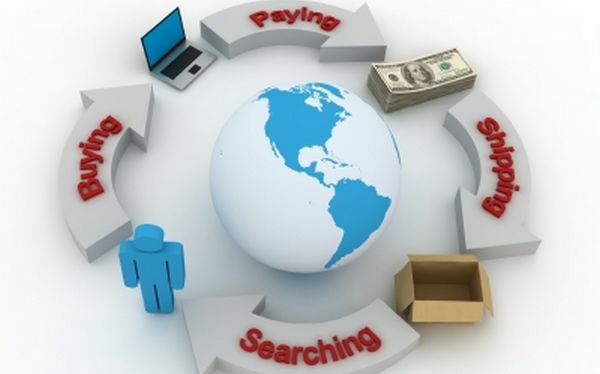 Until buyers complete their research and begin looking for a specific product, they’ll search for a category or brand. For example, before I knew I wanted a “GE Profile 30 in. 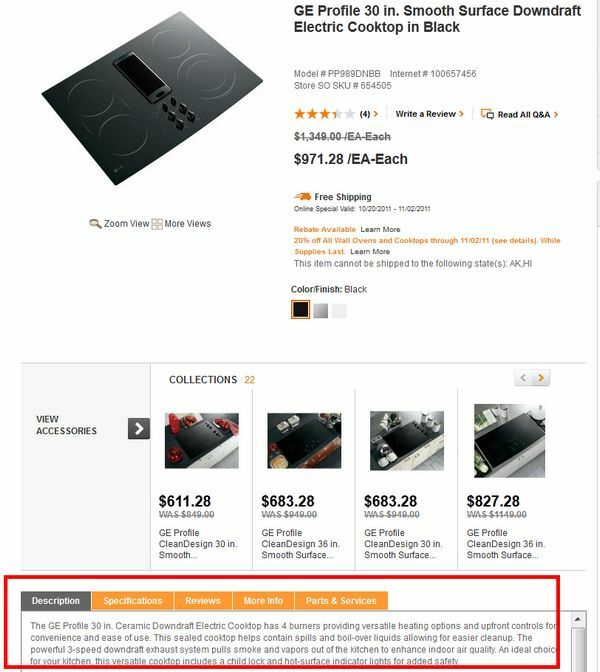 Smooth Surface Downdraft Electric Cooktop“, I probably searched for “electric cooktops on sale” or “GE electric cooktops“. Including a paragraph of descriptive content about that category or brand – this can go at the bottom of the page and it helps users understand exactly what is being displayed on the page. Let’s say you have an entire category of winter jackets going on sale in the beginning of March and you want those to rank for the keyword “winter jackets on sale” or “discount winter jackets”. Most ecommerce stores will simply return the very sale “winter jackets” category page and showcase the items that are on sale with a red icon or something similar. 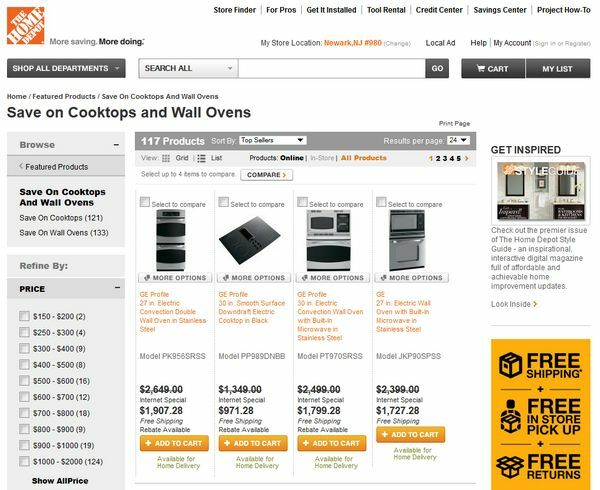 Instead, create a new category page and group all of your sale products there. This way, if you have a whole category of products on sale, they’re grouped in one page rather than scattered through multiple ones. And it allows you to create unique titles, descriptions, and gather inbound links that refer specifically to “sale” keywords. Just like blogs rely on comments to build a community and instigate return visits, ecommerce sites rely on peer reviews to solidify their purchase. The most obvious benefit to peer reviews is to increase your conversion rates; users see honest reviews and feel more confident about buying from you. But, we’re not only talking about conversions – peer reviews, even if just 50-100 words long, are great content pieces because they often use the name of the product in very specific manners (with serial numbers, edition, etc..). Quick side note: If you have access to a programmer, it’s best if you can add the reviews to very same page so users can read them without navigating away. If these basic tips seem like a ton of work, you’re right. But it’s certainly not impossible. An hour or so a day can accomplish wonders in SEO, and you’ll get more proactive over time. It might be a good idea to outsource the initial setup (creating titles/descriptions, category pages, etc..), specially if they have a team of professional writers. You can take over the day-to-day operations afterwards. However you decide to tackle your ecommerce SEO, we hope these steps help you in your journey. As always, the comments are YOURS to ask any questions or give any feedback.